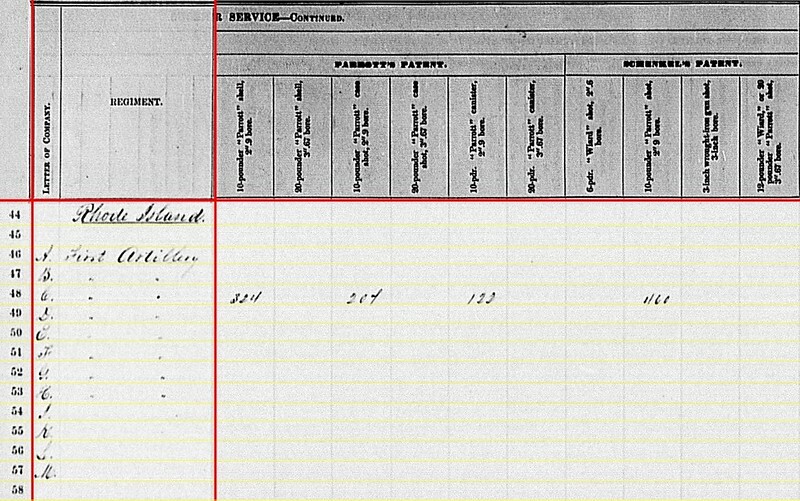 The 1st Ohio LIGHT Artillery…. which needs to be emphasized, as there was a 1st Ohio Heavy Artillery. The “heavy” regiment spent most of the war in garrison locations across Kentucky and Tennessee. The “light” regiment, on the other hand, was active in the field supporting armies in both eastern and western theaters. Colonel of the regiment was James Barnett, who also doubled as the Chief of Artillery, Department/Army of the Cumberland. 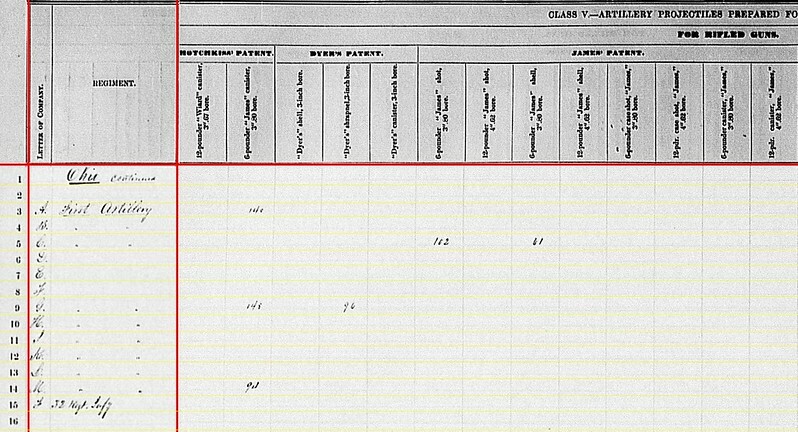 And, as a bonus, we have a line for the 32nd Ohio Infantry and their four cannon. 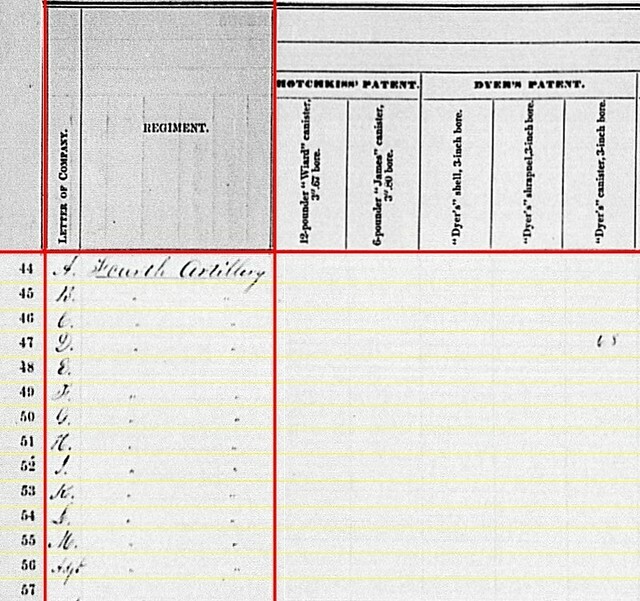 As mentioned while discussing the independent batteries, the clerks opted to misplace what would become the 26th Independent Battery with the 1st Ohio Light. 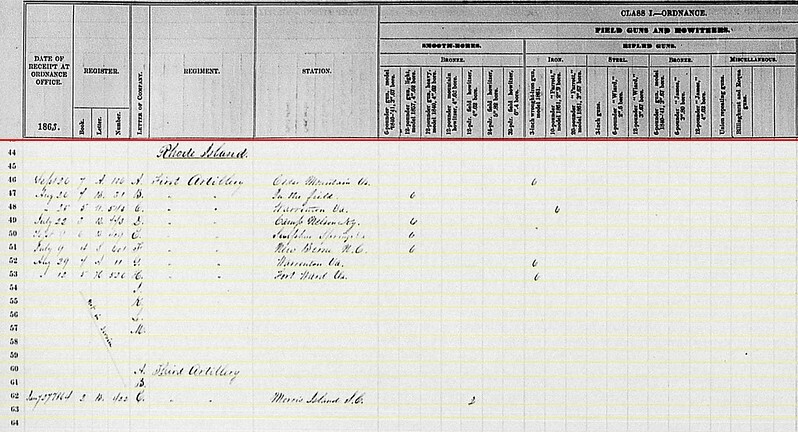 Battery A: Reported, as of August 1864, at Tullahoma, Tennessee with two 12-pdr Napoleons and four 3.80-inch James Rifles. Captain Wilbur F. Goodspeed remained in command of this battery assigned to Second Division, Twentieth Corps, Army of the Cumberland. 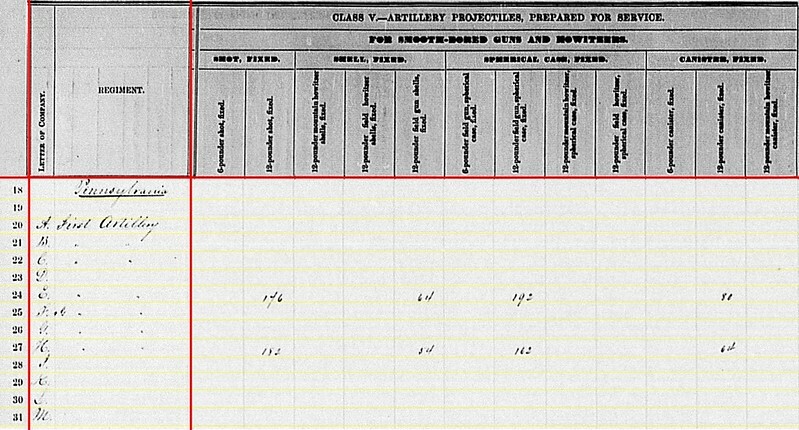 Battery B: “In the field” with two 6-pdr field guns and four 3.80-inch James Rifles. Remaining under Captain William E. Standart, this battery was part of Second Division, Twenty-First Corps (with Standart also serving as division chief of artillery). The battery remained at Cripple Creek, Tennessee until June 24, when it moved with the rest of the division on the Tullahoma Campaign. Battery C: At Elk River, Tennessee with two 12-pdr Napoleons and four 3.80-inch James Rifles. Captain Daniel K. Southwick commanded the battery assigned to Third Division, Fourteenth Corps. The battery supported its parent division on the Tullahoma Campaign. Battery D: No report. Battery D was, as of the June 30 reporting date, in the field supporting the Cavalry of the Army of the Cumberland, supporting different operations and operating by sections. One section, under Captain Andrew J. Konkle supported Second Brigade, First Division, of the corps. 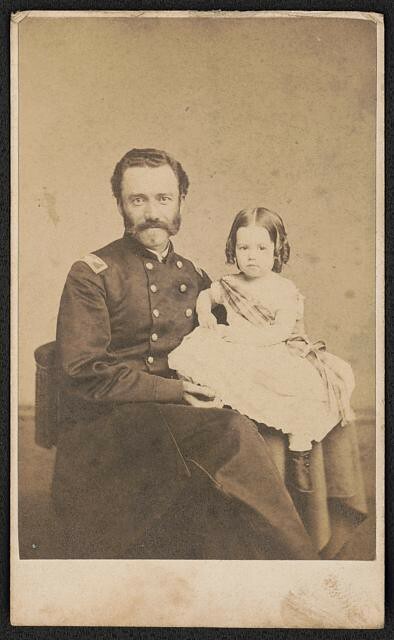 Another, under Lieutenant Nathaniel M. Newell, supported First Brigade, Second Division. A third section supported the cavalry of the Twenty-third Corps, Department of the Ohio, under Lieutenant Henry C. Lloyd. The battery was armed with 3-inch Ordnance rifles. Battery E: No report. This battery was assigned to Second Division, Reserve Corps, still recovering from heavy losses the previous winter at Stones River. It was posted to Nashville through the spring. Lieutenant Stephen W. Dorsey remained in command of the battery. Later in July, the battery moved forward to Chattanooga. Captain Warren P. Edgarton, of the battery, was in command of the Nashville garrison artillery. Battery F: No report. Captain Daniel T. Cockerill remained in command of this battery, part of Second Division, Twenty-first Corps. 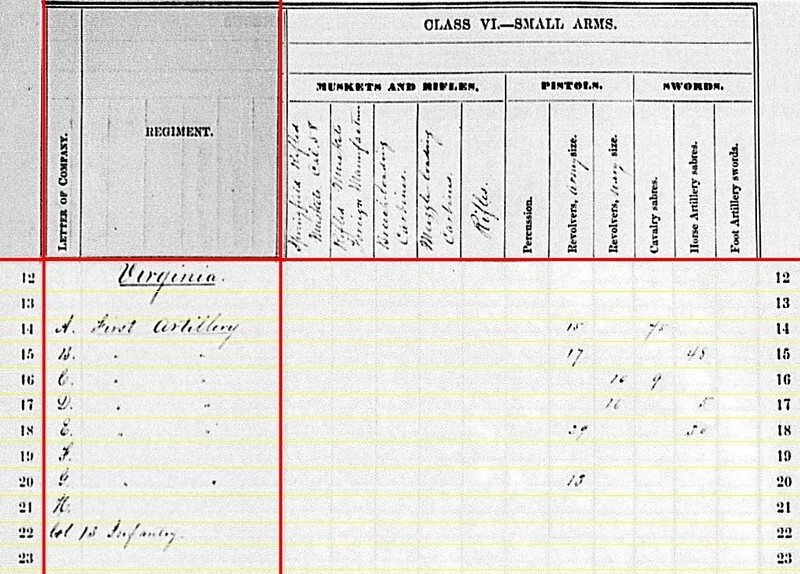 Consolidated reports, complied at the department, indicate the battery had six 12-pdr Napoleons and five 3.80-inch James Rifles (!). Battery G: At Decherd, Tennessee with four 12-pdr Napoleons and two 3-inch Ordnance Rifles. Captain Alexander Marshall’s battery assigned to Second Division, Fourteenth Corps. As such, they were involved with the Tullahoma Campaign. Battery H: At Brownsville, Maryland (likely a location associated with the August 7th report date) with six 3-inch Ordnance Rifles. Although Captain James F. Huntington held the command billet, Lieutenant George W. Norton lead the battery in the field. 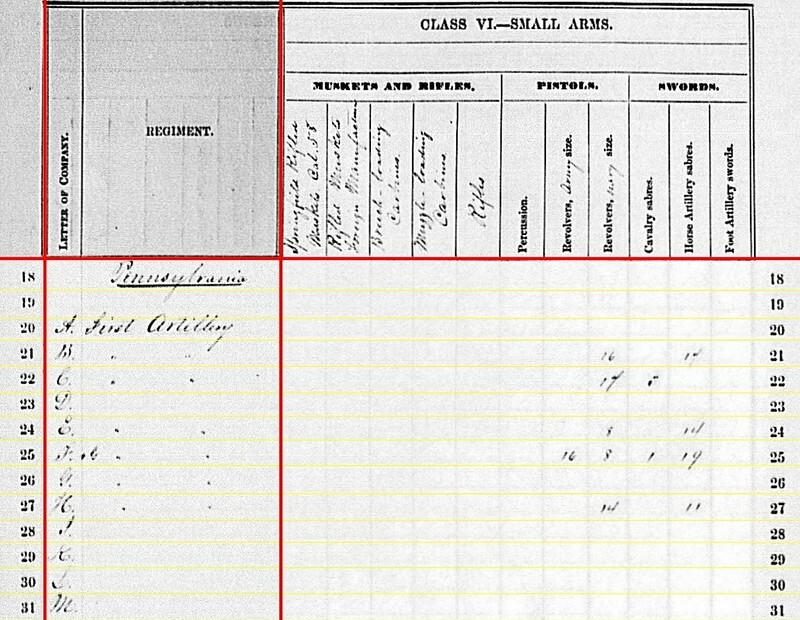 Transferred to the 3rd Volunteer Brigade, Artillery Reserve, Army of the Potomac in late spring. Thus, instead sitting at the base of South Mountain on June 30, Battery H was north of Frederick, Maryland. Battery I: At Emmitsburg, Maryland with six 12-pdr Napoleons. Captain Hubert Dilger’s battery was assigned to Eleventh Corps. Dilger and his battery would do good work supporting the left of the corps on July 1. Battery K: Bridgeport, Alabama, with four 12-pdr Napoleons. 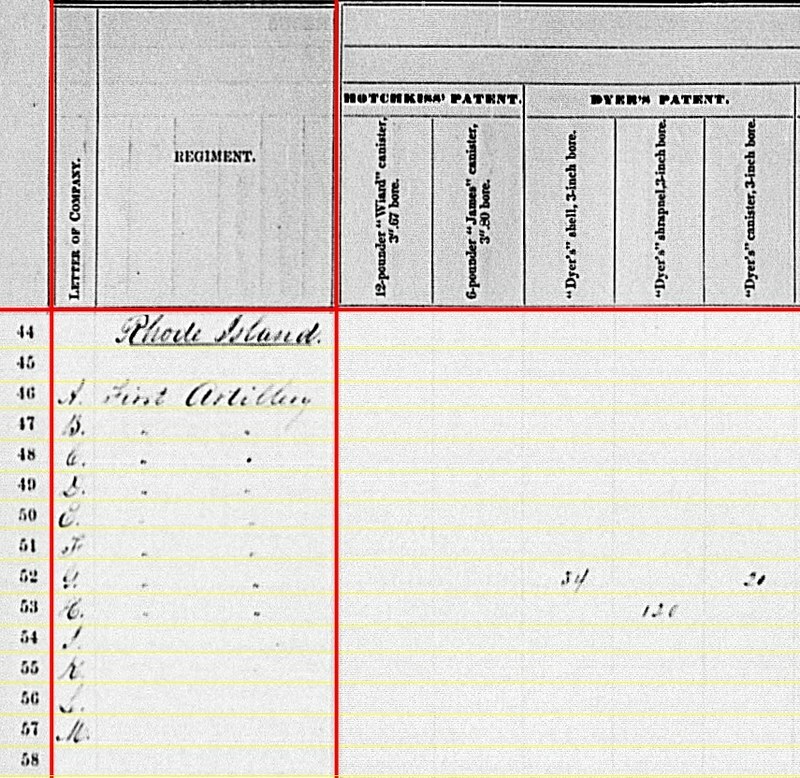 Captain William L. De Beck resigned on May 11, 1863, and was replaced by Captain Lewis Heckman. This battery supported Eleventh Corps. On July 1, the battery went into action just on the edge of Gettysburg (corner of Carlisle Street and Lincoln Avenue today). Heckman reported firing 113 rounds that day, “mostly canister”, in an effort to delay the Confederate advance. The battery lost two men killed, eleven men wounded, nine horses, and two pieces. The location is valid for later in the fall when the battery, along with the rest of the Eleventh Corps, reinforced Chattanooga. Battery L: “In the field” with six 12-pdr Napoleons. Captain Frank C. Gibbs had command of this battery, supporting Fifth Corps. The battery played a vital role defending Little Round Top on July 2, 1863. Battery M: Stevenson, Alabama with two 3-inch guns and four 3.80-inch James rifles. Captain Frederick Schultz commanded this battery, assigned to Second Division, Fourteenth Corps. Thus, instead of being just south of Bridgeport, Alabama, as indicated on this line, the battery was further north, near Hoover’s Gap, on June 30, 1863. Company F, 32nd Infantry: At Vicksburg, Mississippi with two 12-pdr Napoleons and two 3-inch Ordnance rifles. Company F, 32nd Ohio was originally formed in August 1861. In July 1862, the company was detached for service as artillery and known as “Potts’s Ohio Battery” after it’s first commander, Captain Benjamin F. Potts. The battery served in the Shenandoah and was caught up in the surrender at Harpers Ferry in September 1862. The battery was exchanged, along with the rest of the regiment, on January 21, 1863. 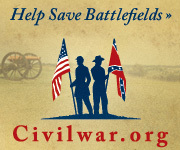 The 32nd was then assigned to Third Brigade, Third Division, Seventeenth Corps, then in operations against Vicksburg. At Champion’s Hill, the brigade captured a Confederate battery. The division commander, Major General John A. Logan, knowing of the unit’s artillery service, assigned the captured guns to Company F. Under Captain Theobold D. Yost, they were called “Yost’s Captured Battery” and were posted opposite Fort Hill in the Vicksburg siege lines. After the siege, the battery was broken up, with men assigned to other batteries. However, in December 1863, the battery was officially reformed as the 26th (Independent) Ohio Battery. 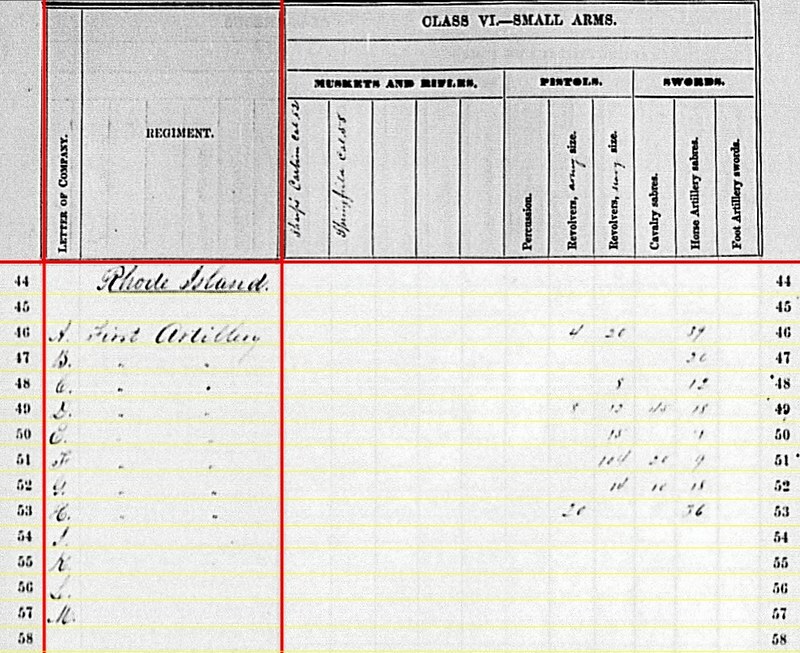 The exact identification of the guns assigned to the battery during the siege, being captured from Confederates, is open for interpretation. From top to bottom, including the battery formed from the 32nd, we see all these batteries experienced active field service that summer. Battery A: 56 shot, 64 shell, 108 case, and 64 canister for 12-pdr Napoleons. Battery B: 40 canister for 6-pdr field guns. Battery C: 13 shot, 42 case, and 46 canister for 6-pdr field guns; 96 shot, 82 shell, 96 case, and 32 canister for 12-pdr Napoleons. Battery G: 77 shot for 6-pdr field guns; 211 shot, 64 shell, 128 case, and 64 canister for 12-pdr Napoleons; 143 case and 46 canister for 12-pdr field howitzers. Battery I: 288 shot, 96 shell, 288 case, and 96 canister for 12-pdr Napoleons. Battery K: 192 shot, 64 shell, 192 case, and 64 canister for 12-pdr Napoleons. Battery L: 300 shot, 102 shell, 280 case, and 117 canister for 12-pdr Napoleons. 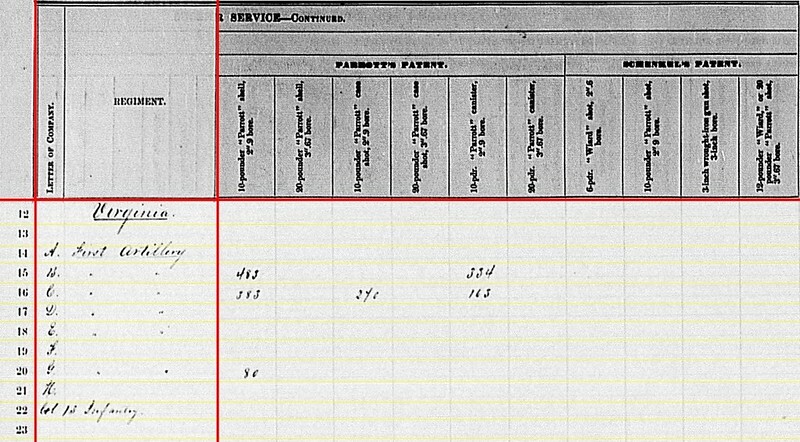 Company F, 32nd Infantry: 17 shell and 20 canister for 12-pdr Napoleons. Two flags to consider with this list. Battery C didn’t have 6-pdrs at this stage of the war, having turned those in sometime in January. But the rounds, theoretically, could be fired from their James rifles. So those might have simply been residual ammunition left over from earlier service… or service ammunition set aside for special use with the rifles. Battery G had no use at all for 6-pdr rounds. And use of howitzer rounds in Napoleons would be puzzling. So this escapes any simple conjecture. 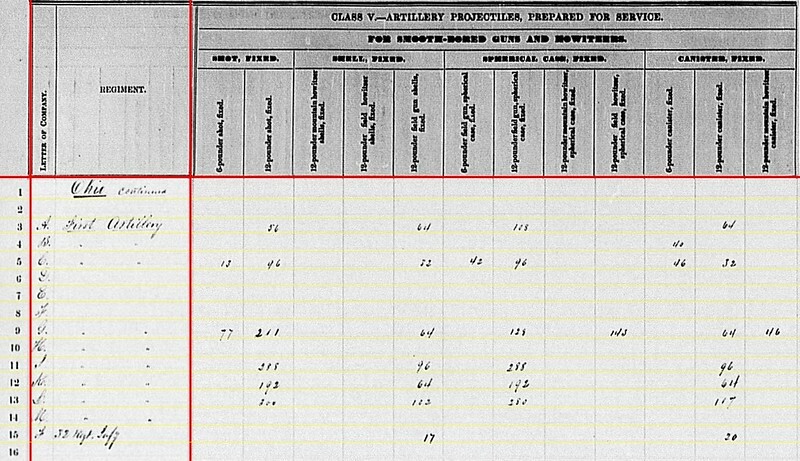 Battery A: 90 shot for 3.80-inch rifles. Battery B: 20 bullet shell for 3.80-inch rifles. Battery C: 109 fuse shell for 3.80-inch rifles. Battery G: 77 canister, 96 percussion shell, and 120 fuse shell for 3-inch rifles; Also 121 percussion shell for 3.80-inch rifles!!! Battery K: 98 canister and 643 bullet shell for 3-inch rifles. Battery M: 56 canister, 115 percussion shell, and 40 fuse shell for 3-inch rifles; And 75 shot, 56 fuse shell, and 180 bullet shell for 3.80-inch rifles. Company F, 32nd Infantry: 107 fuse shell and 451 bullet shell for 3-inch rifles. 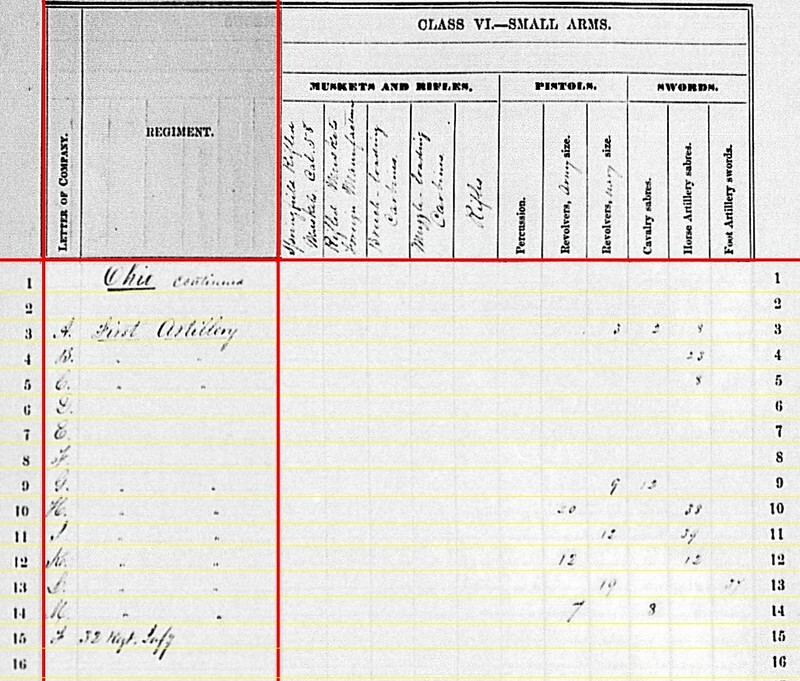 As Battery G had no use for James caliber projectiles, the quantities of that caliber on hand may have been a transcription error by the clerks. But where to put 121 percussion shells, I don’t know. The next page offers a mix of Hotchkiss, Dyer’s, and James projectiles. Battery A: 140 canister for 3.80-inch rifles. Battery G: 148 canister for 3.80-inch rifles. Battery M: 94 canister for 3.80-inch rifles. Here again we see Battery G with James-caliber projectiles… but no James rifles on hand. Battery G: 96 shrapnel for 3-inch rifles. We don’t often see Dyer’s projectiles issued to batteries in the western theater. Battery C: 102 shot and 61 shell for 3.80-inch rifles. Battery A: 318 shell for 3.80-inch rifles. Battery B: 240 shell for 3.80-inch rifles. Battery C: 239 shell for 3.80-inch rifles. Battery H: 349 shell for 3-inch rifles. Battery M: 278 shell for 3.80-inch rifles. Battery B: 180 canister for 3.80-inch. Battery M: 66 canister for 3.80-inch. Battery A: Three Navy revolvers, two cavalry sabers, and eight horse artillery sabers. Battery B: Twenty-three horse artillery sabers. Battery C: Just eight horse artillery sabers. Battery G: Nine Navy revolvers and twelve cavalry sabers. Battery H: Twenty Army revolvers and thirty-eight horse artillery sabers. 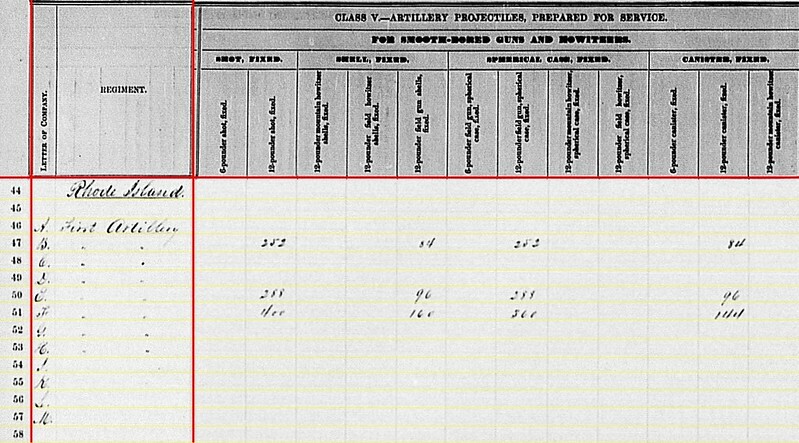 Battery I: Twelve Navy revolvers and thirty-four horse artillery sabers. Battery K: Twelve Army revolvers and twelve horse artillery sabers. Battery L: Nineteen Navy revolvers and thirty-four (?) foot artillery sabers. Battery M: Seven Army revolvers and three (?) cavalry sabers. 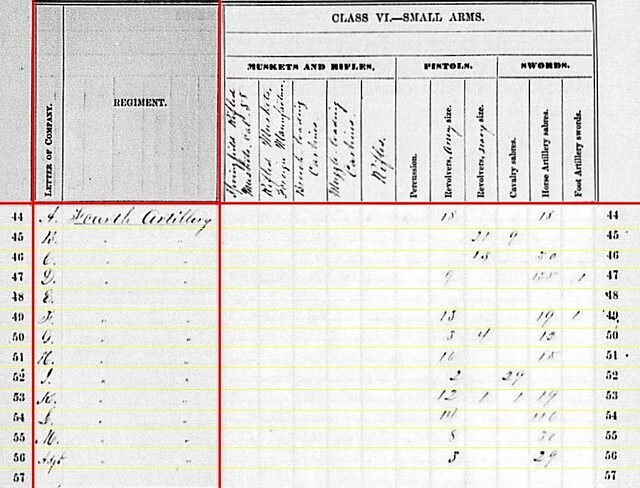 Closing out the Ohio batteries, we find that at the closing date for the second quarter, 1863, all of the 1st Light Regiment were well employed. 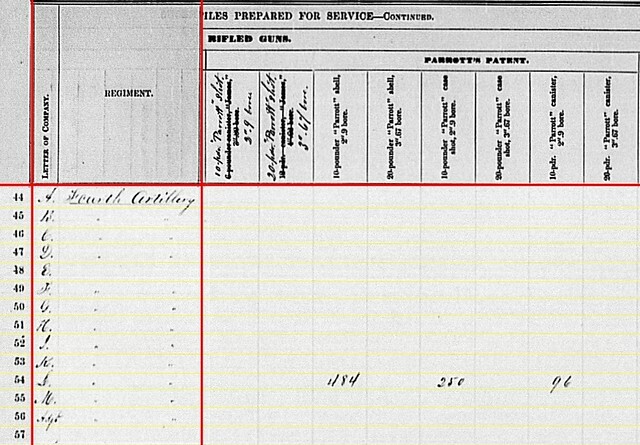 And we must also add the fine work by Company F, 32nd Ohio Infantry to that list.